Hong Kong (HKSAR) – Hong Kong Customs detected two suspected cases of using cross-boundary private cars to smuggle illicit cigarettes yesterday (September 23). About 220 000 sticks of suspected illicit cigarettes were seized. The total market value of the cigarettes was about $620,000 with a duty potential of about $430,000. In the operation, two male drivers aged 27 and 41 were arrested and the private cars used in the suspected smuggling of illicit cigarettes were detained. Customs identified a syndicate using cross-boundary private cars to smuggle illicit cigarettes and distribute them to peddlers speedily. Customs officers took enforcement action last night and intercepted two cross-boundary private cars in Yuen Long. A total of about 220 000 sticks of suspected illicit cigarettes were found in the vehicles. Hong Kong Customs will continue to carry out stringent enforcement action against illicit cigarette activities. Under the Import and Export Ordinance, smuggling is a serious offence. The maximum penalty is a fine of $2 million and imprisonment for seven years. Under the Dutiable Commodities Ordinance, anyone involved in dealing with, possession of, selling or buying illicit cigarettes commits an offence. The maximum penalty is a fine of $1 million and imprisonment for two years. Hong Kong Customs appealed to members of the public to report any suspected illicit cigarette activities by calling the Customs 24-hour hotline 2545 6182. Science to determine the impact of pictorial cigarette warning labels can inform decisions about warning label implementation and adjustments to their contents to maximize impact. This pilot study builds from earlier research on plain cigarette packaging to examine the feasibility of a method for determining the impact of pictorial warnings among smokers. The study was a prospective, within-subjects pilot trial where smokers ages 18-30 (n = 10) were exposed to pictorial warnings on their cigarette packs. On day one, participants completed a baseline interview with an expired carbon monoxide reading and affixed pictorial warning labels to their cigarette pack(s) they would use the next day. On day two, participants completed mobile phone text message assessments of smoking behaviors and protocol adherence. On day three, participants completed a follow-up interview similar to baseline. We achieved 100% sample retention and adherence with procedures. Compared with baseline assessments of perceptions and behaviors related to existing text-only warnings, at follow-up participants were more likely to report that pictorial warnings used during the study were noticeable (M 4.1, SD 1.3 vs. M 2.7, SD 1.2, p = .013), stopped them from smoking (M 1.6, SD 0.8 vs. M 1.1, SD 0.3, p = .052), and conveyed health risks of smoking (M 3.5 SD 1.3 vs. M 2.2, SD 1.1, p = .006). At follow-up, participants also reported the protocol was acceptable. These findings suggest this is a feasible method that with further validation could provide evidence that can inform decisions regarding implementation of pictorial cigarette warnings. Are Imperial Tobacco Group Plc & British American Tobacco Plc Running Out Of Puff? Despite its unpopularity with governments and international organisations globally, the portion of the world’s population that smokes remains stubbornly high, even after years of tax increases and unilateral health initiatives that have all attempted to bring down this number. It is the addictive nature of smoking that provides tobacco companies with resilience throughout the economic cycle, thereby affording them the cherished, defensive status within London’s community of listed companies. It is this status, along with a strong performance within the underlying businesses, that has consistently propelled Imperial Tobacco (LSE: IMT) and British American Tobacco (LSE: BATS) to new highs during recent years. However, today I write to urge caution to those investors that are hoping for continued gains from these shares — as it could be that this period of outperformance is about to come to a halt for both companies. An extended period of ultra low interest rates, in addition to sustained earnings and dividend growth, has enabled the expanding balance sheets of Imperial Tobacco and British American Tobacco to go largely unchecked. Now, with an increase in both US and UK interest rates just around the corner, both companies may soon need to think about deleveraging. At present, debt/equity sits at 1.93x and 2.48x for BAT and Imperial Tobacco respectively, while gearing comes in at 69% and 59% respectively. Even for defensive companies, these numbers are slightly disconcerting, particularly when considering that annual earnings growth is often confined to the low-mid single digits for tobacco firms. In addition to slightly overweight balance sheets, an extended period of generous dividend growth has now begun to reduce the level of dividend cover offered by BAT and Imperial Tobacco to uncomfortably low levels. Dividend cover at British American Tobacco is the lowest of the two companies, coming in at just 1.2x DPS, while consensus projections for earnings suggest that EPS growth will remain in the single digits out until at least 2017. However, in its defence, the group has made no prior commitment to a set rate of dividend growth here. Instead, management have repeatedly stated the while increasing the payout is a priority, this will only happen as and when its is possible to do so. Dividend cover is much more pertinent issue for Imperial Tobacco, who have pledged to grow the payout by 10% per annum over the medium term, even though cover was just 1.15x in 2014. Furthermore, consensus earnings projections for Imperial Tobacco indicate that it will fare little better than BAT when it comes to EPS growth over the coming years, as the annual pace of expansion here is also expected to remain in the mid single digits until 2017. This places a considerable question mark over the viability of further dividend increases over the medium term and I now believe it is possible that shareholders may find themselves being left disappointed at some time between now and the end of the above forecast horizon. In summary, while it may certainly be possible for both companies to maintain the current per share distribution over the next 24 months, further growth is looking increasingly unlikely over the near term. This will make it difficult for the shares to record further gains from here and, as such, it probably means that the lengthy period of outperformance that both companies have enjoyed is now coming to an end. If, like me, you are growing wary of the risks surrounding the traditional pillars of support for your portfolio, or are just concerned about the prospect of turbulent times up ahead; then you may find some of our analyst’s team’s most recent recommendations of interest. If so, then you can view them for free by clicking the link here. It won’t cost you any more than the time it takes you to read them, so why not have a look at which stocks the top analysts at Fool UK are buying today. James Skinner has no position in any shares mentioned. The Motley Fool UK has no position in any of the shares mentioned. We Fools don’t all hold the same opinions, but we all believe that considering a diverse range of insights makes us better investors. 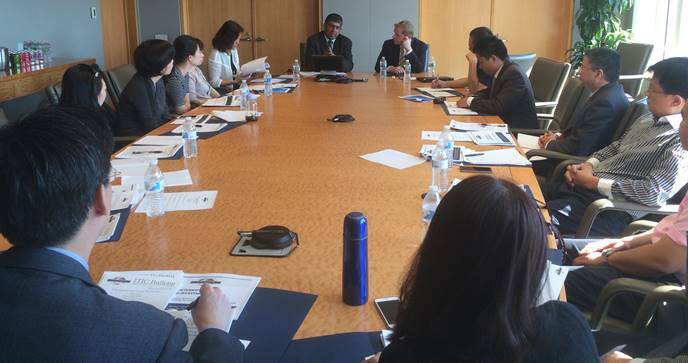 On Friday, 18 September, ITIC held a roundtable discussion in Washington with a visiting delegation from the Shenzhen Local Taxation Bureau in China. Jon Talisman, Former Assistant Secretary of the Treasury for Tax Policy, spoke to the delegation about the status of tax reform in the United States. ITIC Senior Advisor Hafiz Choudhury then led a discussion on regional tax coordination and the taxation of e-commerce, both in the United States and internationally. ITIC sponsor Goldman Sachs graciously hosted the seminar in its Capitol Hill office. New rules will ban smoking in cars with children on board from 1 October 2015. The new British law is designed to protect minors from inhaling tobacco smoke – and will apply to drivers and passengers in any ‘enclosed vehicle’. That means the ban only applies to closed vehicles, so you can smoke away to your heart’s (dis)content in a convertible. Just remember that sunroofs don’t count. Anyone breaking the fine is liable to a £50 fine. Smoking in cars, when children are inside the vehicle, is set to be outlawed across Coventry and Warwickshire next week. When the new legislation is introduced on October 1, it will become illegal for Coventry and Warwickshire drivers to light up when anyone under the age of 18 is inside a vehicle. The aims of the new law – which comes into effect after work from campaign groups – is to protect children and young people from the dangers of second-hand smoke. A flouting of the new law would land drivers and the smoker in question an on-the-spot £50 fine. Health groups have backed the new laws, with charity Action on Smoking and Health saying that the move means children have more protection than ever from the dangers of second-hand smoke. Deborah Arnott, chief executive, said: “Generations of children have grown up protesting about having to put up with smoking in cars. Finally, their call has been heard and from October this year they will be protected by law.